Seminole Beach Direct Oceanfront North Palm Beach, FL 33408 | Sotheby's International Realty, Inc. The estate takes full advantage of its oceanfront location, blurring the lines between indoors and out and affording the most pleasurable resort-caliber lifestyle. Measuring 25,878 square feet, it offers 11 bedrooms, 18 baths, and an array of spaces ideal for indoor-outdoor living and entertaining. The style of British West Indies-with its breezy outdoor spaces and light-filled, view-focused interiors-offered inspiration and was respectfully adapted for relaxed, refined modern living. Combined formal living and dining spaces feature serene ocean views, a warming fireplace, and "disappearing" glass walls that allow for easy indoor-outdoor living and entertaining. The relaxed family room opens to an alfresco dining area. The kitchen includes top-tier appliances, an island with a hidden television, a coffee bar, refrigerator drawers, a walk-in pantry, Leeds and Artistry cabinetry, counter seating, and a breakfast area with a view of the waves. The office encourages serious contemplation; its ocean vistas, carefree daydreaming. The alluring freshwater swimming pool offers both a waterslide and a relaxing spa. The Cabana House's lower level offers a bar, billiards, pool access, and ocean views. At the top of a spiral staircase is a versatile room-ideal for an office or yoga and meditation space-with retractable glass walls. Glass rails afford uninterrupted vistas on the sun-soaked upper Cabana House terrace. In the dramatic central stairway, a custom-crafted three-story light fixture composed of Swarovski crystals glimmers as though imitating the inspiring ocean just outside. The master suite is a peaceful aerie offering his and her baths, three fireplaces, a spacious walk-in closet, a retractable projection television, and a glass-railed balcony. The focus of her lavishly appointed bath is a window-side soaking tub. Each guest bedroom possesses a distinctive feature-such as a built-in bed and a mesmerizing surf-centric mural-and includes an en suite bath and a walk-in closet. Guests will appreciate oversized windows and balconies offering wide-open ocean vistas. A ladder in the hallway accesses a rooftop terrace with a breathtaking panorama. Charming and very private, the guesthouse comprises two apartments, each with a cozy living area, a kitchenette, two bedroom suites with closets, and a terrace. In the lower-level "bunk room," visitors will be enchanted by a one-of-a-kind mural whose lighthouse illuminates. The spacious fitness center accommodates a wide variety of equipment and offers a mirrored wall, built-in speakers, a unique underwater window with a view into the pool, and doors opening to a terrace. The luxuriously comfortable theater has D-Box motorized love seats and a kitchenette. The temperature-controlled wine cellar and tasting room has custom-designed racks, an island with seating, storage for glasses and other necessities, and unique backlighting. The auxiliary kitchen is expertly outfitted with an island, abundant storage, eight hooded gas burners, a fryer and a steamer, all by Wolf, and refrigerator, freezer, and ovens by Electrolux. The approximately 1.4-acre property was designed for ideal oceanside living, including extensive swaths of lush green lawn and gracefully swaying mature palm trees. The grounds also offer two sitting areas—one poolside—with warming fire pits, an oceanside half basketball or pickle-ball court, a play area lined with artificial grass, and a private putting green. Rarely has consummate coastal living been so effortless or so elegant. $49,500,000 11 Bedrooms15 Full / 3 Partial Baths23,176 sq. 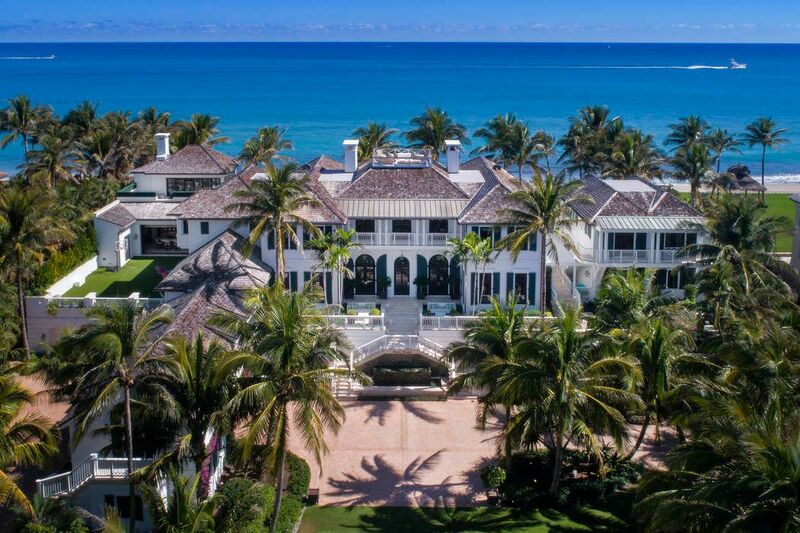 ft.
Palm Beach Daily News, "Elin Nordegren Lists Oceanfront Mansion for $49.5 Million"
Palm Beach Post, "Elin Nordegren Lists Oceanfront Mansion for $49.5 Million"
E!, "Elin Nordegren Lists Palm Beach Mansion for $50 Million"
Golf Digest, "Elin Nordegren, puts Palm Beach property on market for $50 Million"
The Wall Street Journal, "Elin Nordegren Lists Home for $49.5 Million"
Mansion Global, "Elin Nordegren Lists Home for $49.5 Million"
Secluded on 1.4 gated acres in Seminole Landing is an estate of understated elegance and Caribbean inspiration. The 25,878-square-foot residence takes full advantage of its oceanfront location, blurring the lines between indoors and out and allowing for the most pleasurable resortlike lifestyle. The style of British West Indies-with its breezy outdoor spaces and light-filled, view-focused interiors-offered inspiration and was adapted for relaxed, refined modern living. The formal living and dining room is subdued and sophisticated, featuring ocean views, a warming fireplace, and disappearing glass walls that allow for effortless indoor-outdoor living. Elegantly styled and outfitted for culinary pursuits, the kitchen includes an island with a hidden television, a coffee bar, refrigerator drawers, a walk-in pantry, counter seating, and a breakfast area with a beach view. The adjoining family room gives way to an alfresco dining area. At the center of the soaring stairway, the three-story Swarovski crystal chandelier glimmers in imitation of the ocean. On the upper level, the master suite is a peaceful aerie with his-and-hers baths, three fireplaces, a walk-in closet, and a balcony for enjoying the sights and sounds of the Atlantic. Each of the four uniquely stylish guest bedrooms includes an en suite bath and walk-in closet. A rooftop terrace affords a breathtaking panorama. The lower level offers a temperature-controlled wine cellar, a theater, a fitness center, a catering kitchen, and a four-car garage. The grounds offer swaths of lush lawn, a swimming pool with a waterslide and a spa, lounge areas with fire pits, a half basketball court, and a putting green. The estate also encompasses a delightful "Cabana House" and a guesthouse that comprises two, two-bedroom apartments. The community offers proximity to the Seminole Golf Club and numerous other championship courses, completing the consummate Florida lifestyle.